Thanks for participating in the Cycle for Youth Science Bike-a-thon fundraiser. We really appreciate your support, and look forward to biking with you at Greenfield Lake on Saturday, 25 August 2018 starting at 8am. Cycling is a fun and rewarding physical activity. I hope that you will embrace and enjoy this experience. I know that I can’t wait to share this experience with you all! It will be a fun day! Now that you are registered it is now time for you to prepare for the event and start getting sponsors. I have provided some tips and further information below to help you get ready. Please let me know if you have any questions or have your own tips or images that you would like to share with the other riders. I would be happy to include anything cycling or science related on the website or social media, so please email me at mnemiopsis@me.com (or have your parents email) or contribute ideas or questions to the Cycling Torque discussion board. We will also have group training rides and partake in community service projects at A Bike for Every Child. Have fun cycling and please check out the tips below to help you get ready for Cycle for Youth Science. Happy peddling! How far should I ride in the Cycle for Youth Science Bike-a-thon? Each participant should first estimate how far they would like to ride during the Bike-a-thon. Setting this goal early is a great way to start, but be realistic when doing so. The Greenfield Lake loop is about 4 miles in distance, which should take between 15 to 45 minutes to complete depending on your experience. It is ok to set an ambitious goal but make yourself a training plan that will enable you to achieve your intended distance that you will ride in the Bike-a-thon. Greenfield Lake is open to the public, so why not take a test ride to see what you could achieve? How do I go about getting sponsorship? Each rider is encouraged to seek sponsors to raise funds for YSA and A Bike for Every Child programs. Young riders should approach people they know or that they are familiar with, such as family, friends, and neighbors, and we encourage elementary and middle school riders should be accompanied by an adult or guardian when asking people for sponsors. What should I say to people when asking about sponsorship? “Good morning/afternoon, my name is Ellie. 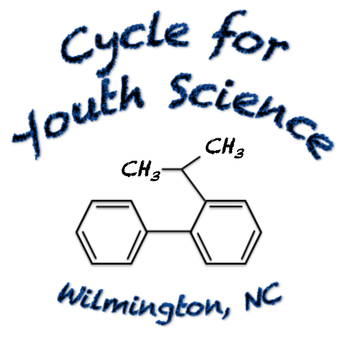 Would you like to support local youth scientist programs in Wilmington by sponsoring me in a bike-a-thon fundraiser. 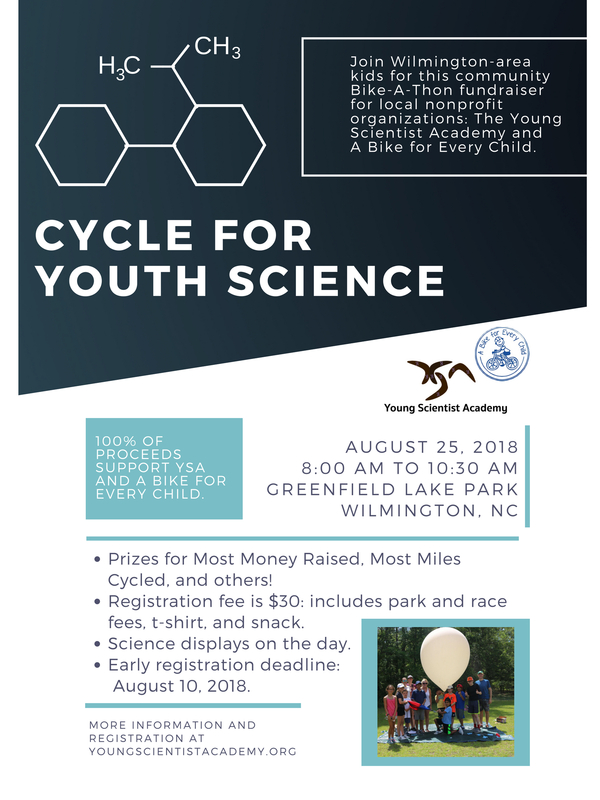 I would like to raise [insert value] dollars for Young Scientist Academy and A Bike for Every Child by riding [insert distance] miles in the Cycle for Youth Science bike-a-thon”. 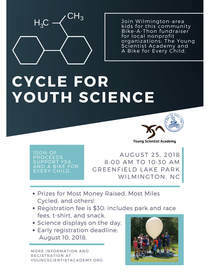 Some people may have some follow up questions such as “what is Young Scientist Academy?”, “When is the ride?”, “How far would you like to ride?” or “What will the money be used for?” I recommend becoming familiar with this information sheet and please feel free to print to present to potential sponsors. If you have any questions please call or email Dr. Rob at (910) 386-1867 or mnemiopsis@me.com. How much should I ask for from sponsors? This will depend on how far you intend to ride. Some people will want to pay a set amount and some people will be happier to pay per mile. Sponsorship can vary from $1 per mile to a total of $25. Every little but helps and remember to thank everyone for their generous support! What if people don’t want to sponsor me? Some people may not be interested in sponsoring you. This is ok, you should thank the person for their time and wish them a good day. Always be pleasant and smile. How do I record sponsorship? Each sponsor will be recorded by filling out the 2018 Cycle for Youth Science Pledge Sheet.